Kyrou presided over a trial of our surrealist (and therefore atheist) art exhibition. He should not have done so. Our exhibition directly and unapologetically showed how passages from Deuteronomy (and other Biblical passages) relate to Mein Kampf and Hitler. [more: unbowedatheist.com] [ more: Petition to Geneva ]. We declare that we have the right to be atheists and surrealists and express our ideas regardless of frontiers. It is in the essay accompanying Pythia between χαός and χασμός, in which the "offending" Greek words written in Greek script (that Redleg objected to) appear. And it is in the essays in which Greek script is used that the the Biblical basis for Mein Kampf was shown in our exhibition. Kyrou found the use of "foreign words" (Greek) expressed "potentially offensive statements" and that this gave Redleg the right to attack the integrity of our exhibition, and attack our ideas and our person, with the posting of disclaimers and a "WARNING!". The entire publication Humanist Transhumanist (being the exhibition content) appears as Annexure 11 in the Geneva Petition. The portion reproduced in the graphic below (pp. 30-32 of the publication) can be found here. Pp. 30-31, Humanist Transhumanist showing painting Pythia between χαός and χασμός. 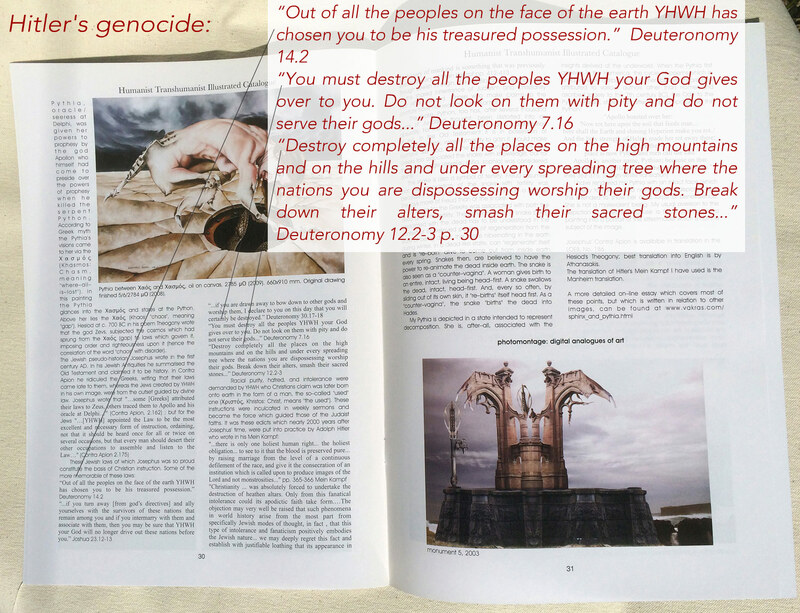 The racial purity pursued by Adolf Hitler is called for in Deuteronomy. Christianity, specifically the New Testament, gave rise to Hitler's racism leading to genicide. 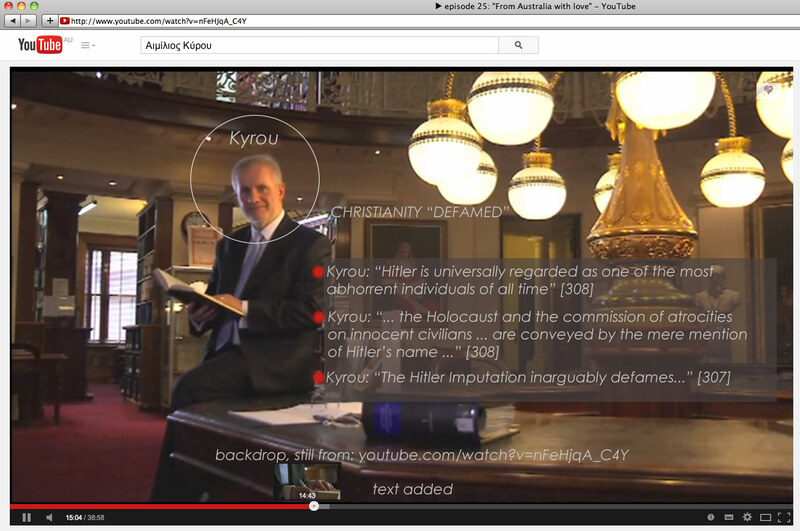 Kyrou's adverse finding against us – which Warren, Ashley and Digby with regard to the Hitler element overturned – proclaimed "the mere mention of Hitler's name" is defamatory in any association. As our exhibition already included Hitler as the subject, we had already committed a "pre-defamation". And, the association made with Hitler in our exhibition was with Christianity. On the grounds that follow, Kyrou should never have presided over the matter. Per our Petition to Geneva , he is a tireless proselytizer for the Christian religion whose principles our exhibition incontrovertibly showed culminated in Hitler. 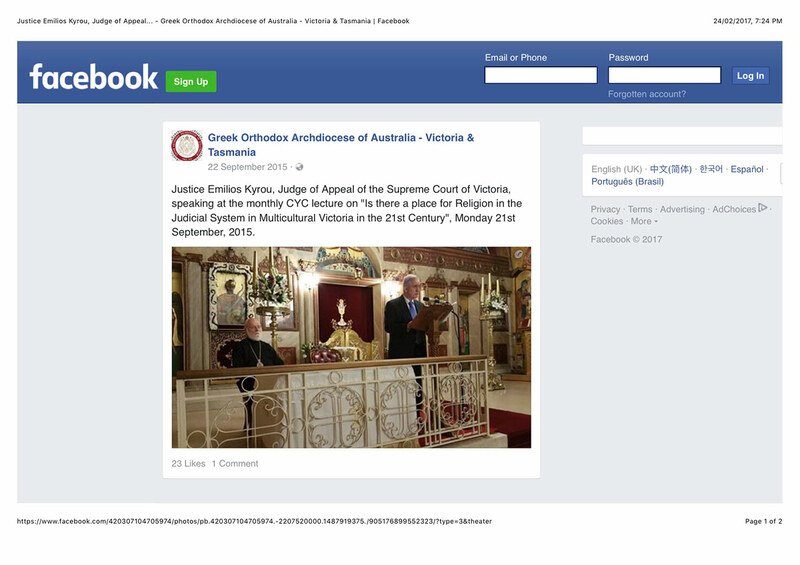 Below, a photograph of Kyrou posted by the Greek Orthodox Archdiocese shown delivering a sermon on his belief of the religious basis of "the Law" from the pulpit at Saint Eustathios Church. Kyrou attributes to the Bible the principles of law that underpin his role and duty as judge – while our exhibition showed that those very same Biblical edicts on "the Law" were the basis for the intolerance of Hitler that ended in genocide. Kyrou advocates the literal Biblical propositions promulgated by the church. 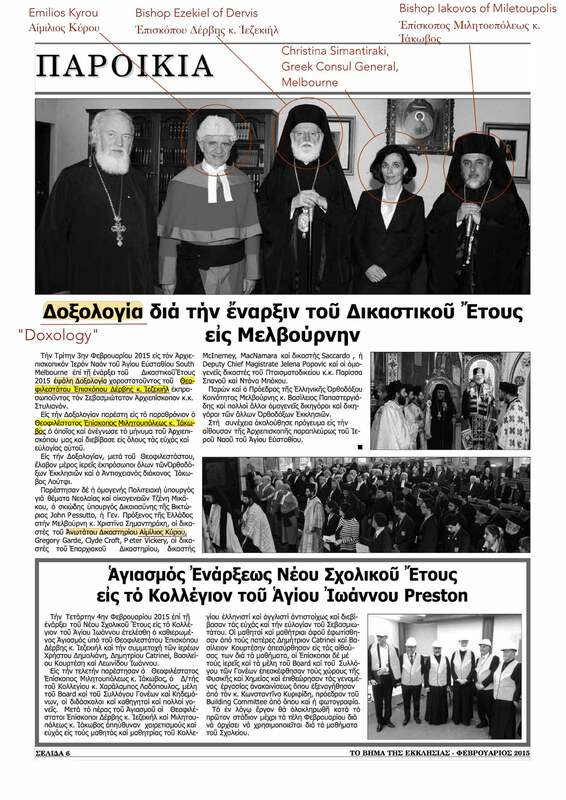 This can be seen in what Kyrou has written in the Greek Orthodox Fundamentalist website "Mode Of Life" which proclaims its antipathy to "apostasy", and presents itself as an "alternative to atheism" (Annexure 26 of Geneva Petition). In Mode of Life Kyrou proclaims that the "doxology" given to the court "seek[s] guidance of the Holy Spirit and blessings of strength, wisdom, truth and justice for the legal system" (Annexure 25 of Geneva Petition). QUID PRO QUO: Kyrou champions Greek Orthodox religion and the Archdiocese. 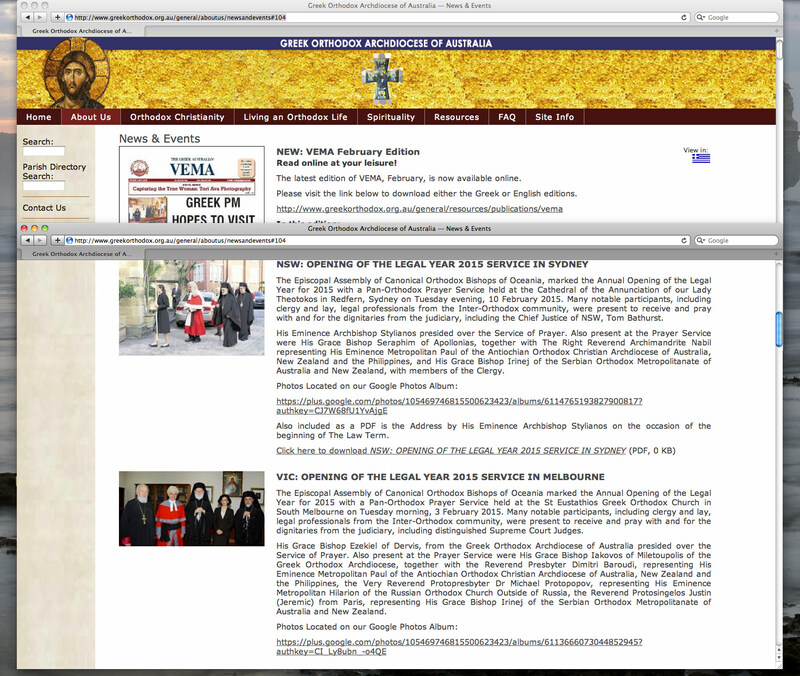 In turn the Greek Orthodox Archdiocese have championed their champion – with official Greek government support – on their website and featured him in their Greek-language edition of "Vema". During the trial it proved impossible for Kyrou to conceal his disdain for us, and impossible for us not to have noticed. This resulted in a complaint made against Kyrou by us (document submitted as Annexure 24 of Geneva Petition). This complaint was not responded to by the Supreme Court – instead the court removed its complaints procedures page and the associated pdf from its website within 10 days. A subsequent complaint against the court was made by us to the Victorian Attorney General. All subsequent court hearings have been poisoned by the bias of Αιμίλιος Κύρου. His findings were in contradiction to evidentiary material, in disregard of law, in contempt of law and scandalous. Nevertheless, Kyrou's findings have, in the form of the High Court's affirmations (by Keane, Edelman and Nettle), overturned Australian statutes based on international covenants that had been enacted to protect human rights, and this has gone unremarked by Australia's Human Rights Commission – hence our petition to Geneva. A separate complaint has been made to the Australian Human Rights Commission, regarding its failures that have ended with the legitimisation per Nettle's decision of July 2017 of race discrimination in Australia which is breach of the ICERD. That complaint to the Human Rights Commission can be found here. Judicial corruption is entrenched in Australia and is permitted by its highest court, the High Court of Australia. Though Australia is a signatory to, and has obligations under Article 11 of the United Nations Convention against Corruption, it has yet to enact any law that would curb judicial corruption. We are petitioning the Australian government to amend the Defamation Act of 2005 to make Australian law consistent with its international obligations.